Thank you to YouCopia for providing me with product, free of charge, in exchange for my honest review. All thoughts and opinions shared are my own. I love, love, love my coffee. Seriously, I don't know how I would get through the day without it. Being pregnant, I have had to switch to dreaded decaf, and I'll be honest, that's been a bit struggle. I have had to kiss many of my favorite K-Cups goodbye, and store them for later- or for a special occasion. Even though I can't enjoy my favorite coffees right now, I still love being able to offer them to my guests. K-Cups are awesome, and great to have on hand, but I hate seeing those K-Cup boxes just stacked on the counter or in the pantry- so messy and unattractive. Thankfully, one of my favorite household solution brands has come up with a great way to eliminate the need for all of those unsightly boxes! YouCopia is a company that believes that our homes should work so that we can play when we're at home. Finally! YouCopia creates 'AH-HA!' products for the home, which are sleek in design, fully functional, can be easily stored and concealed, or left out in the open. The company was founded by father-daughter duo Mark and Lauren Greenwood in 2006. Mark has 30+ years experience as an inventor in various industries, and sought to change the traditional 'spice rack.' Thus, their very first product, the Spice Stack, was born, and the team looked ahead to the future of great kitchen products! The CoffeeStack is ingenious! 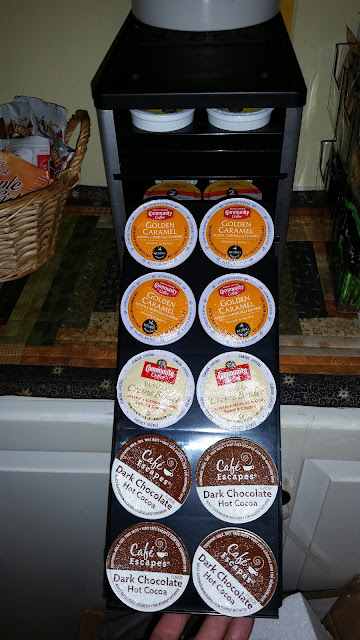 I know that there are a lot of different K-Cup and coffee pod storage options, but truthfully, I haven't liked any of them that I've seen elsewhere. I have small storage spaces, and really need to try to take advantage of vertical space in my home. A round storage carousel would take up too much space, and would be oh, so tempting for my son to play with. K-Cups are too expensive to be wasted, so secure storage is important! The CoffeeStack is specifically designed to hold and organize 40 K-Cups! Wow- that's a lot of coffee! The CoffeeStack is less than six inches wide, so it's a great size to store in your cabinet! 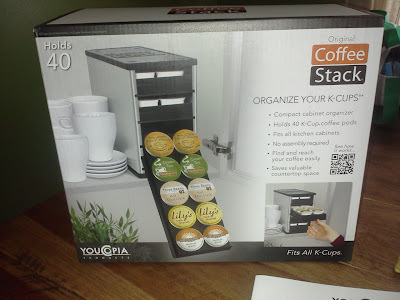 It features four holder drawers, which each have ten holes for holding the K-Cups. The drawers pull out, and fold down, so you can actually see your K-Cups, and select the flavor you want with great ease! I loaded my CoffeeStack with two boxes of brand new K-Cups, and was surprised by how quickly I was able to just pop those right into their holes, lift the holder up, and slide it into the CoffeeStack for storage! Check out all of these cold beverage K-Cups, organized on one shelf. The drawers of the CoffeeStack are light, and easy to slide out, and drop down, for easy selection. 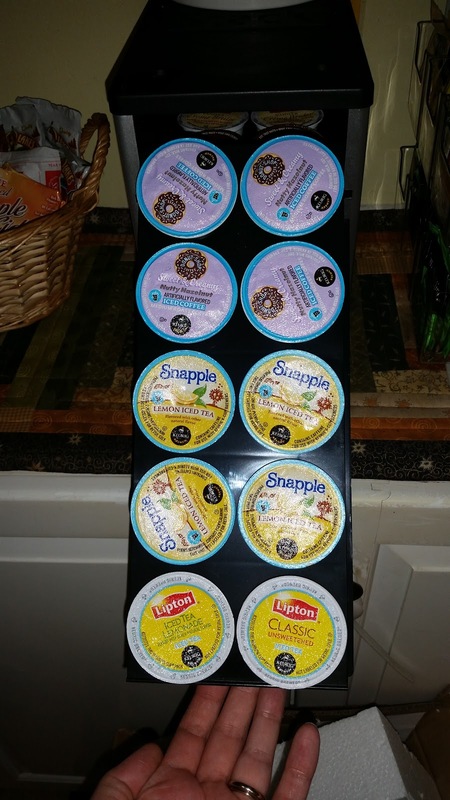 After you've selected your K-Cup, just lift the drawer back up, and slide it back into place! Mmm... hot cocoa and coffee! I actually really like the way that my CoffeeStack looks sitting out, right there on top of my beverage bar for all to see! I enjoy having my K-Cups accessible for my guests. This way, if they'd like a cup of coffee, I can direct them to the CoffeeStack, and they can just select whichever flavor they'd like, and it's super easy! Plus, I sort of like showing off really neat products, and this one is definitely unique! 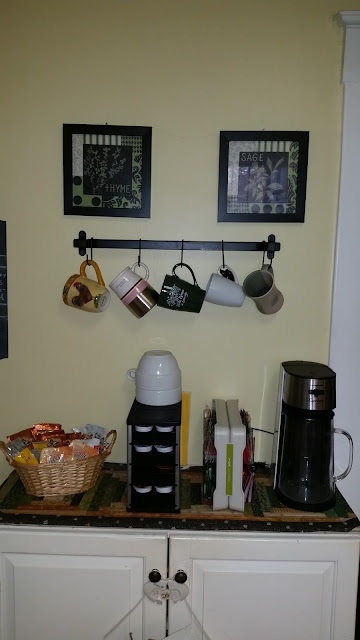 Here's a peek at the CoffeeStack on my beverage bar. I love that my guests can just come over to the bar and help themselves to tea, coffee, hot cocoa or apple cider! Makes them feel like they're in a hotel! The sleek black and silver coloring of the CoffeeStack, compliments the black and silver appliances we have in our kitchen, and looks nice with our green accents. One of the best things about being able to leave the CoffeeStack out, is that even though my son can reach it, he doesn't quite understand that the drawers have to be pulled out (and I'm not going to show him how it works, either! ), so (for now, at least) I know my K-Cups are safe from harm! YouCopia also has a similar product for coffee pods and cafe' cups! Plus, they offer a SpiceStack (in different sizes), a MedicineStack and a BakeStack! 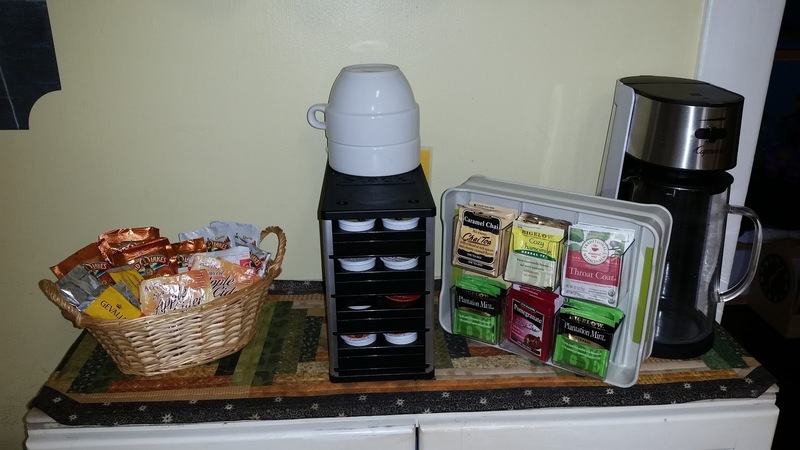 I love to be organized, and having products like these help me to feel much less stressed, and they make it easy for my husband to put things back where he found them. I've got to hand it to Mark and Lauren- they really nailed it with these products! Aside from being a great addition to any home, these would also make really neat gifts for newlyweds, new parents, new homeowners, college students, etc. If there's a coffee lover in your family with a brewing system, get them a CoffeeStack (or a similar stack for pods, etc)- they'll thank you for it! I love the CoffeeStack so much, that I am giving one to my parents for Christmas, and I would love to give one to my grandmother, and my uncles, too! Opening the cabinet with no surprises. Your husband finding the oregano without your help. Showing off a perfectly alphabetized spice collection. Viewing your coffee, not rummaging through it. Reaching the back of your cabinet without a stool. Head to the YouCopia website to learn more about all of their wonderful products! Click here for a list of retailers who carry Youcopia products. Connect with YouCopia! Find them on Facebook, Twitter and YouTube! If you try a YouCopia product and like it, don't forget to share the love! One lucky MBP reader will win their very own YouCopia CoffeeStack! Get ready to get those Cups organized, with ease! Just use the Rafflecopter entry form below to enter for your chance to win! Open to US Residents, only- 18 & older. 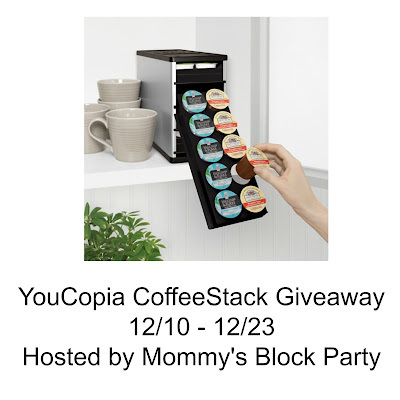 Special thanks to our friends at YouCopia for allowing me to get my K-Cups oragnized and stored with their awesome CoffeeStack and for offering a fantastic giveaway for our readers, too! 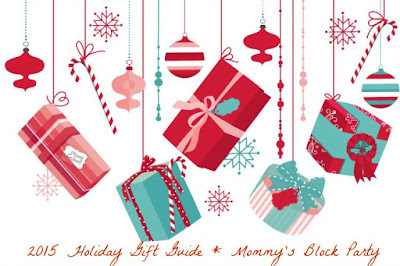 YouCopia is a sponsor of the MBP Holiday Gift Guide. We would use this on our breakfast bar with out Keurig. I would use it at work. I'd set it on the counter next to the Keurig. Thanks. I would use the CoffeeStack on my kitchen counter next to my Keurig brewer.